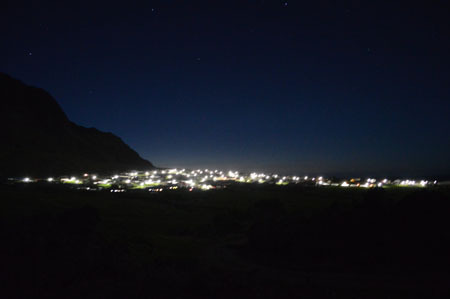 Photographs of the village at night, with the recently installed street lights. Also Nightingale by moonlight. 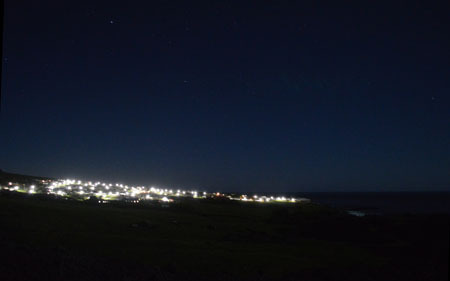 Photo taken by Alex Mitham from the 1961 lava flow looking westwards to the Tristan Settlement and the Goat Ridge beyond with a clear night sky above at about 22.30 on 11th January 2014. 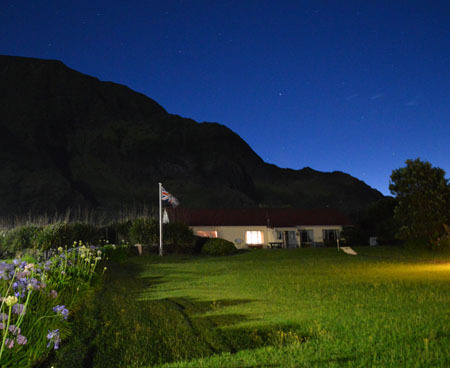 Photograph from Administrator Alex Mitham taken on 15th December 2013 on a clear night looking across the lawns of The Residency (where he and Hasene live) towards the Goat Ridge. The Administrator's Flag flies from its usual flagpole and the lawn is bathed in light from the new street lamps which in 2013 made walking in the Settlement much easier at night, especially when cows are grazing there! 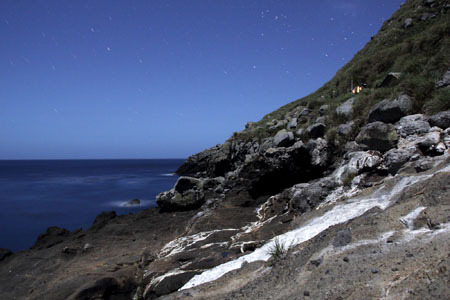 Moonlit night at The Rock on Nightingale Island captured by Otto Whitehead on 24th September 2012 during an extended visit with Antje Steinfurth, RSPB's Katrine Herian, Dougie Swain and members of the Tristan Conservation Department including Head of Department Trevor Glass, Kirsty Green and Julian Repetto. The photo was published in an article written by Antje Steinfurth which appeared in the August 2013 Newsletter.